Smart insulin pens are used to deliver insulin for the treatment of type 1 and type 2 diabetes. Smart insulin pens have additional features such as memory function, time and dose recorder, and data transfer. Rise in prevalence of both type of diabetes in children and adults, due to obesity and changing lifestyle and dietary habits, is a key factor that is anticipated to drive the global market for smart insulin pens. Additionally, technological advancements and integration of glucose monitoring and therapeutics for better diabetes management are likely to propel the global smart insulin pens market. However, availability of alternatives for insulin delivery is anticipated to restrain the global market. 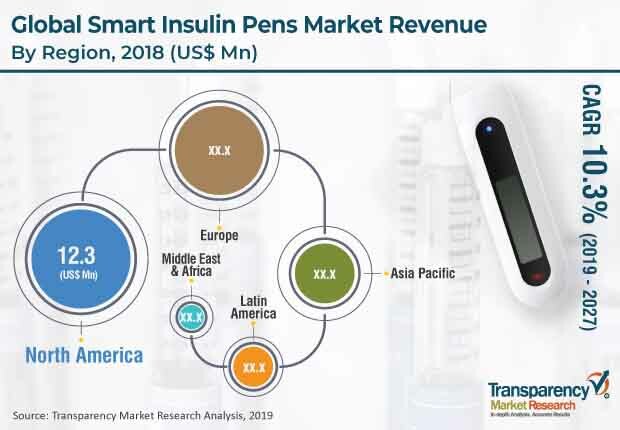 The report offers detailed segmentation of the global smart insulin pens market based on product, connectivity type, application, and distribution channel. The market has also been segmented based on region (North America, Europe, Asia Pacific, Latin America, and Middle East & Africa). Adoption of technological advancements and increase in prevalence of diabetes are likely to drive the global smart insulin pens market. In terms of product, the adaptors for conventional pens segment accounted for a leading share of the global market in 2018, and the trend is anticipated to continue during the forecast period. Increase in prevalence of diabetes in people of all ages across the globe is projected to boost the segment during the forecast period. Expansion of the smart insulin pens segment is attributed to technological advancements such as memory function and accurate dose administration. Emerging technologies in smart insulin pens are projected to boost the global smart insulin pens market during the forecast period. iSenz is an adaptor for smart insulin pens that possess a feature to detect the insulin level, by scanning. It provides the correct angles for injections in order to optimize the injection sites for diabetes. Easylog is an adaptor for insulin pens connected via the internet. This product provides the right dose and offers better comfort to the patient for the treatment of chronic diseases such as diabetes. InsulCheck, is cap for insulin pens that contains a sensor to track pen usage and temperature. North America has a large number of smart insulin pens approved for the treatment of diabetes. In the U.S., significant increase in the prevalence of diabetes is likely to propel the region’s leading share of the global market during the forecast period. Additionally, product launches and approval for smart insulin pens are anticipated to drive the market in the region. The report also provides profiles of leading players operating in the global smart insulin pens market. These include Novo Nordisk A/S, Sanofi (sanofi-aventis US LLC), Eli Lilly and Company, Companion Medical, Emperra GmbH E-Health Technologies, Diabnext, Jiangsu Delfu medical device Co.,Ltd, BERLIN-CHEMIE, DIAMESCO CO., Ltd., and Patients Pending Ltd (Bigfoot Biomedical Inc.). In July 2018, Companion Medical, a provider of advanced technological products for diabetes, received approval from Food and Drug Administration for InPen in the U.S. This product approval enabled the company to strengthen its digital diabetes products portfolio in the U.S. In March 2018, sanofi-aventis U.S. LLC received approval from U. S. Food and Drug Administration for Toujeo Max SoloStar. This product approval enabled the company to strengthen its product portfolio.